The Estonian Society of Central Florida (Kesk Florida Eesti Selts) celebrated the 95th Anniversary of Estonian Independence Day with a special program, lunch and raffle at the Countryside Country Club in Clearwater, Florida, on Saturday, February 23, 2013. More than 60 guests celebrated this special anniversary. The program was designed to reflect Estonian values: love of country; faith; the honoring of soldiers and heroes willing to make the ultimate sacrifice for liberty; love of language, music and education; Estonians’ playful spirit; and respect for “Kodu Eestlased” and Välis-Eestlased” who form one family, one nation. Reflecting on her life as a first generation Estonian American, Mrs. Kaie Põhi Latterner brought us to tears and laughter. The keynote address was delivered by Mrs. Kaie Põhi Latterner. Additional program participants included KFES President Tõnu Toomepuu, Ms. Monika Orumaa Craig, Mr. Jüri Toomepuu, Mrs. Triin Karr, and Honorary Consul of Estonia Lisa Mets. The raffle was deftly handled by Ms. Marju Cabrera and beautiful table decorations were made by Mrs. Tiiu Slankis. The Estonian Society of Central Florida owes its thanks to Mr. Rein Raja and Mrs. Maare Kuuskvere, who pulled all the strings together to weave the tapestry for the day’s program. Mrs. Tiiu Slankis once again adorns our tables with floral centerpieces: Where there’s an Estonian, there’s a flower! Generous offerings for the loterii. Mr. Tonu Toomepuu, KFES President, welcomes guests. Mrs. Kaie Põhi Latterner accompanies us in the singing of the US National Anthem. Monika Orumaa Craig, second from right, had offered the invocation for the ceremony. Mr. Juri Toomepuu offers words remembering fallen soldiers and Eesti’s many fights for sovereignty and independence. Mrs. Triin Karr reads a commemorative poem. 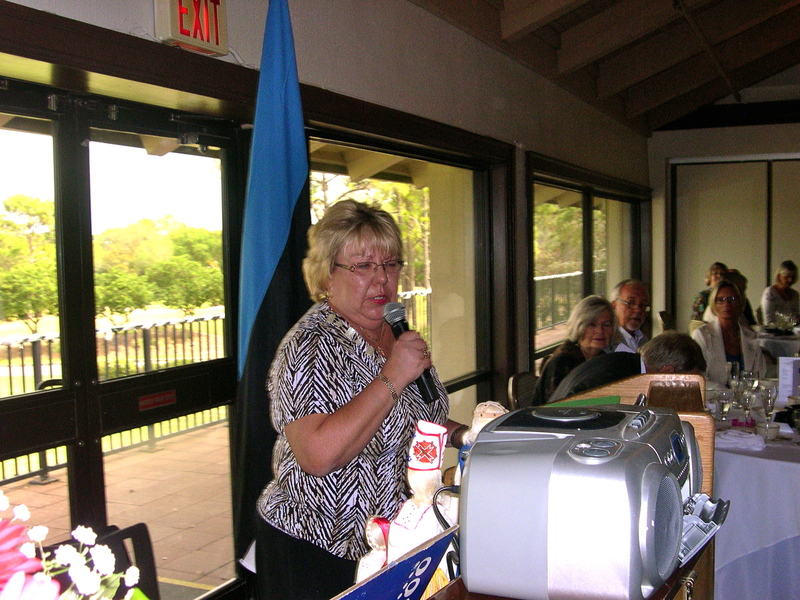 Mrs. Kaie Põhi Latterner delivers the keynote address to the Estonian Society of Central Florida (KFES Eesti Vabariigi 95.a tähistamine), February 23, 2013, Clearwater, Florida. The dolls were props in Mrs. Latterner’s remarks. Mrs. Kaie Põhi Latterner accompanies our songs. There was lots of interest in loterii piletid! Mrs. Kaie Põhi Latterner leads the audience in song. Lisa A. Mets, Honorary Consul of Estonian and KFES Vice President and Webmaster, offers concluding remarks. The loterii; hmm, what to choose?